When it comes to effective SEO packages, there is plenty of talk on reaching your ‘target’ audience. This makes sense – after all, reaching out to the wrong people simply wastes resources – but very little conversation takes place on how to identify and target this audience in the first place. Here are some of the best ways to do exactly that. When it comes to choosing the right keywords, don’t just focus on those with the biggest monthly searches. If you do, you’re likely entering a highly competitive market and, perhaps more dangerously, you’re entering searches that aren’t related to what you’re offering. Somebody looking up “cars”, for instance, isn’t always looking for “car repairs” or “new car for sale”. In fact, someone who is actively looking for what you offer will put in a more specific search term, and it’s in these longtail keywords that you can truly target your audience. It’s better to use a search term with half as many monthly searches, if its more relevant. 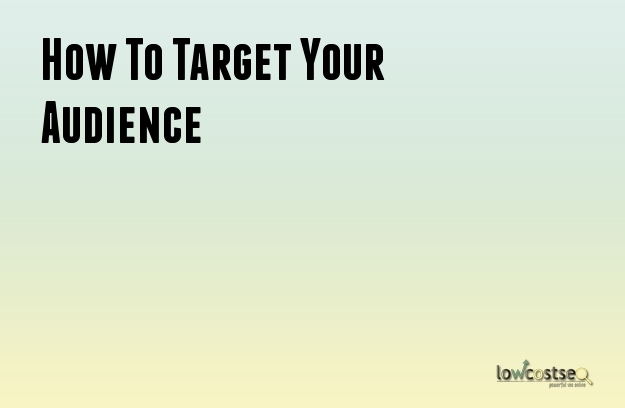 This results in a better click through rate and overall conversion, which is what you want. If you have access to social media – and you really should – it’s a great way to interactive with your existing customers, as well as reach out to new ones. However, it’s also a vital way to collect data from existing customers. How do people refer to your service? What terms and words do they specifically use? What are the most commonly related topics or areas of overlap when it comes to your customers’ other interests? How actively engaged are your community? Do they regularly interact with you, or just when your services are required? All of these can be collected via social media, yet offer a fantastic way to tailor your SEO or PPC strategy. Use the language your customers use, as this is what they search for. Understand other similar areas, as this is a great place to develop outreach. As for community engagement, interact with people at a frequency and level they appreciate. If they rarely search for areas relating to you, then the content you produce needs to be extremely useful and to the point, rather than an on-going series. When it comes to forming a coherent strategy, it helps to break down your audience into a visible persona. This is best with as few persona’s as possible, but broad topics might have 2 or 3. Some SEO experts like to give this personality a name, but what is important is that you give it an age, gender, job, location, likes and dislikes based on the research and awareness of your audience you have collected. For all purposes, this person is your audience. Tailor your SEO strategies towards this person specifically, as this will target the central mass of your audience. If its not fitting with this persona, is it going to help you? Branching out is always useful, but if your main focus isn’t targeting this conceptual person, then its arguably not going to be effective. Some people even prefer to write as this person. Developing content and campaigns from this perspective is always useful, as it forces you to ask who they are, what they want and how they want it. This is all ideal for fantastic SEO development.